…is the german minister for defence. He is an aristocrat with a long title, a castle and an aristocratic composure. His style, his assertivness and the home stories in a couple of glossy magazines enchanted us oridinary people. His fellow politicians from the CDU know why they elevated him from the last row into the limelight of the political stage in these dull times. I am getting a little lazy with the english versions lately. 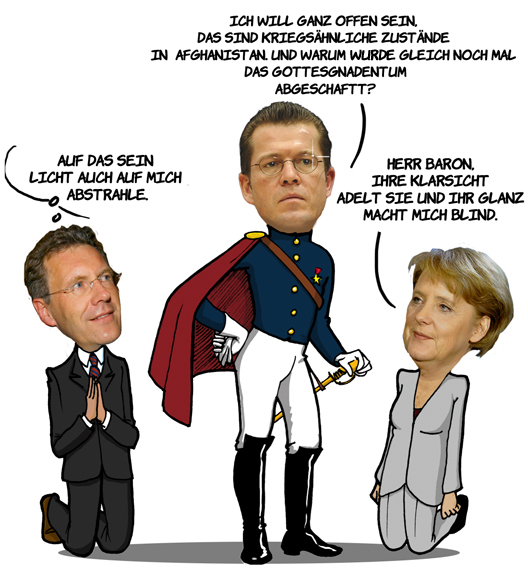 What they are saying is about this: “Let thy light come upon me”, says the kneeling guy (Christian Wulff) The Minister of Defence Count von und zu Guttenberg says that it seems to be a war in Afghanistan. Mrs. Merkel feels blinded by his shine and clearsightedness. 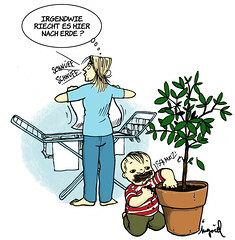 Another dull moment out of parents´ life who are not quite themselves for a couple of years. 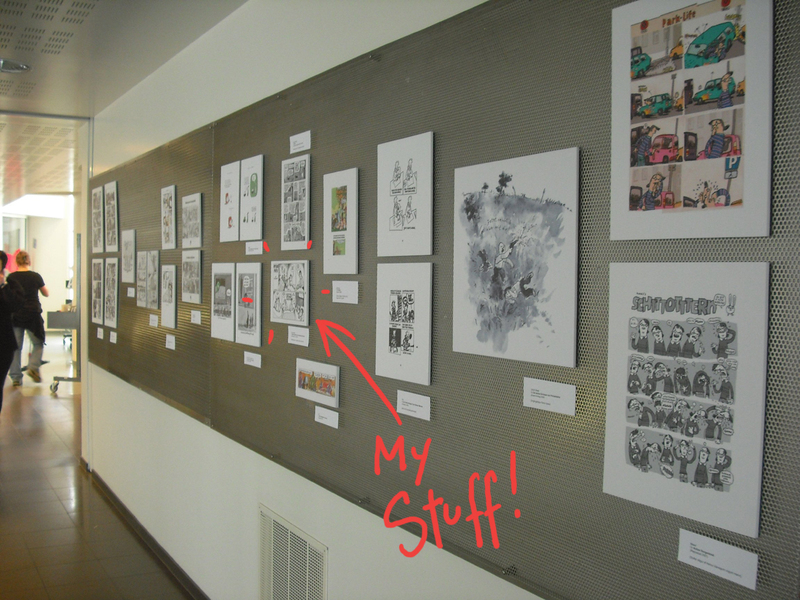 There was a exibition at the Goethe Institute in Reykjavik about the comic scene in Germany and I was part of it with one page from my last book. Yipiieh! Posted in Illustration | Comments Off on My Stuff in Reykjavik! I am not really happy with it, but this is the first draft of the cover…. And the colour is all wrong. 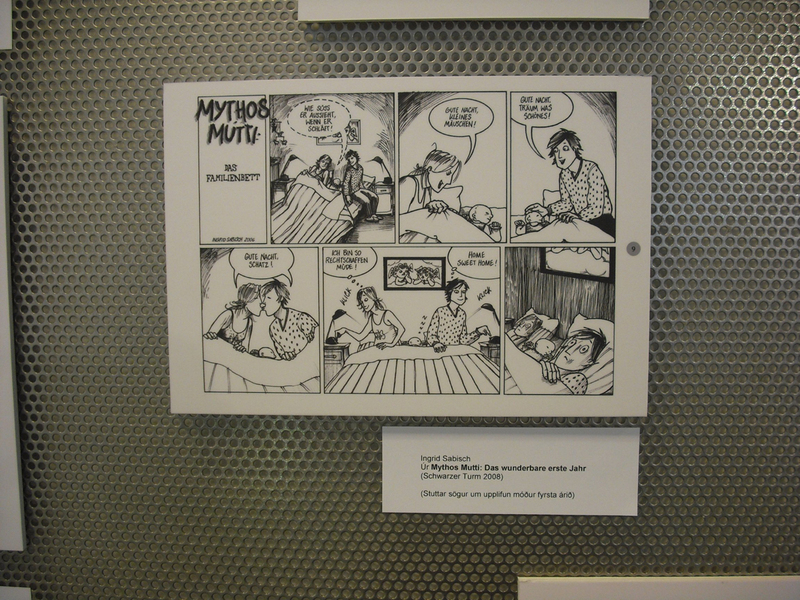 This is the first story I did for the next Mythos Mutti Comicbook (Myth of Mum, sort of like this, hard to translate). Look at it. My husband says this story is too severe to make a funny out of it. But it really happened to me like that ( my sons did not get hurt) and it is the embarrasment and shame you feel, so you would not tell not anybody about a incident like that. A couple of weeks ago I saw this happening to a dad and I remembered. So judge for yourself and let me know! Hallo, jetzt auch in Muttis Sprache. Ich habe mich entschlossen Mythos Mutti weiterlaufen zu lassen: Vorab im Internet. Mein Mann findet die Geschichte zu krass, um sie zu erzählen, aber meine Mission ist es ja, auch von den peinlichen und beschämdenen Ereignissen zu erzählen. Was meint ihr? Schaut es euch an und lasst mich eure Meinung hören, danke! 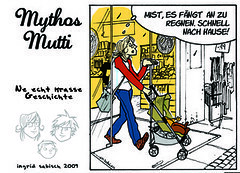 Click on image you get to flickr.com where can browse through the Mythos Mutti set.